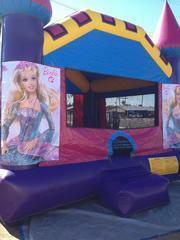 Bounce House, Tables, Chairs, and Snow Cone Package | AZ Jolly Jumpers Party Rentals | inflatable rentals in Glendale, Arizona. Great for the warm summer days. Let the kids enjoy the day while bouncing in the jump house and cool everyone off with a refreshing snow cone. Let us bring the party to you book now.